It was the last week in September, and you know what that means… LOTS and LOTS of comics! Seriously, I bought 20 comics and we wind up talking about 14 of them in this podcast! We wind down the last of the 52 #1s from DC Comics and get JC’s take on the new Aquaman, The Savage Hawkman, Batman: The Dark Knight, Teen Titans, Blackhawks, All-Star Western, Justice League Dark, and Superman. Marvel gives us a couple of great “Point One” issues with Black Panther and New Avengers, Warren Ellis starts his run on Secret Avengers, and more in the life of the All-New Ultimate Spider-Man. And finally, IDW surprises us with Star Trek #1, taking JJ Abram’s crew where no-man (well, William Shatner) has gone before, by presenting the original series stories within the alternate timeline. Hey, what can I say? I’m excited for Who Mourns for Adonis and The Trouble With Tribbles. 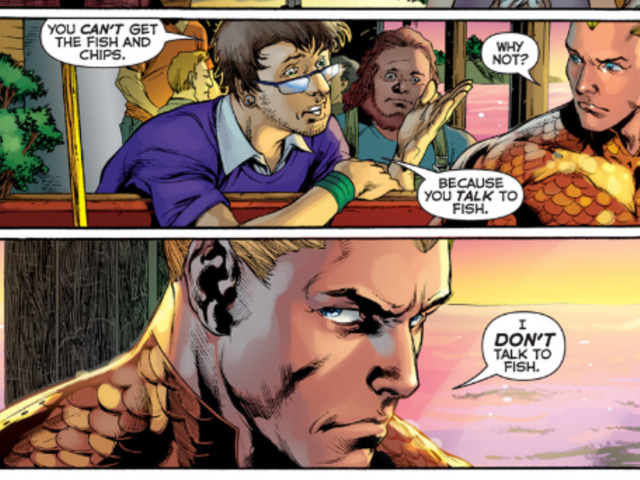 Jeff and Jon become Aquaman Fans (they hope), and Jeff speculates on the “no more trunks” meeting they must have had at DC. All that and much much more! Finch is one of the best artists out there. Christian Bale is Welsh (and I realize that no one but myself and Ioan Gryfudd aka Reed Richards of FF movies, cares!) And yes, I completely agree that 90’s era comics were more about sheer quantity than any sort of quality. Another entertaining show gentleman… and good idea for inserting the Defen Media promo. ‘Nuff said!